Some of them have been famous for more than a thousand years, others for several decades, but all come from privileged terroirs where geology, climate and exposure form an exceptional harmony. All of them are born from this special alchemy that unites air, earth, vines and the art of men. 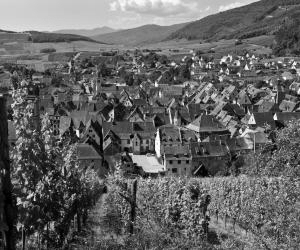 Very early on, the Alsatian winegrowers noticed the specificities that certain places called conferred on the cultivation of their vines and their wines. Since the 9th century, Alsatian winegrowers have referred to the notion of Grands Crus.They noticed the specificities of certain places influencing the cultivation of their vines and their wines. Thus, the best terroirs are born from the observation and know-how of generations of winegrowers. Over time, they have revealed the most remarkable soils, often steep and ideally exposed. 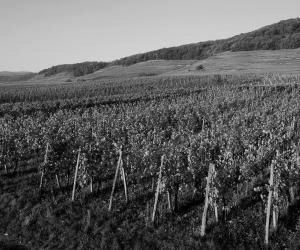 Today, the mosaic of Alsace Grands Crus is made up of 51 terroirs delimited by strict geological and climatic criteria. The resulting wines account for about 5% of production. 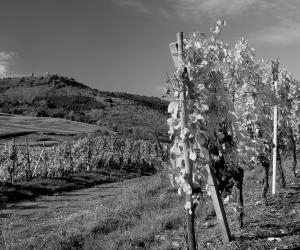 Situated on the sub-Vosgian hills, between 200 and 400 metres above sea level, and ideally exposed, the Grands Crus benefit from maximum sun exposure and an extraordinary diversity of soils. These advantages, combined with a judicious choice of grape varieties best suited to each terroir, favour a slow and prolonged ripening of the grapes and the emergence of aromas of great finesse. On a smaller scale, the exposure of the hillsides, the soil's thermal storage capacities, the protection of the reliefs and the influence of a river induce a whole series of micro-climates, from which the 51 Grands Crus benefit in the first place. The specificity of the great Alsatian terroirs lies in a mosaic of soils of unequalled richness and diversity. It is in these infinite modulations that a large part of the exceptional diversity of Alsace wines, and in particular Grands Crus, resides. In the tertiary era, some 50 million years ago, after re-emerging in the Alpine orogeny, the Rhine massif collapsed in its centre gradually giving rise to the present Rhine plain. The successive collapses have helped to reveal and compartmentalize all the geological layers to the extreme. Subsequently, marine and river deposits and erosion work added further complexity. 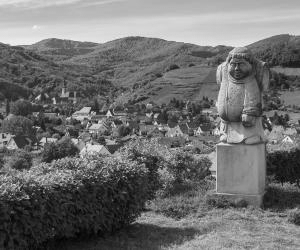 In the end, three types of landscape have distinguished themselves on the Alsatian side of the ditch: the Vosges mountains (granite and sandstone, sometimes shale), the sub-Vosgian hills with an incredible diversity of soils, and the alluvial plain of the Rhine (marl and alluvial). Four fracture fields (Saverne, Ribeauvillé, Rouffach-Guebwiller and Thann) further fragment the vineyard. Located on the sides of the Vosges Mountains, they are composed of eruptive or magmatic rocks that crack and disintegrate to form coarse sand called granitic arena, with low water retention. The fertility of these soils depends on their degree of alteration, which contributes to the release of mineral elements.The wines produced on these chemically acidic soils are always very expressive in their youth, with a light structure. Shale is a laminated rock derived from the compression of clay within the earth's crust.Quite rare in Alsace (Andlau and Villé), these soils are rich in fertilizing elements. Structured around the freshness, racy, the wines produced on these terroirs take a long time to bloom. 300 million years ago, volcanoes provided lava and ashes that were consolidated underwater. The rock is hard, compact and easily disintegrates. These dark stony soils, which retain the heat well, transcend the grape varieties. The wines, with smoky aromas, are ample, well-structured. Sandstones are indure or cemented quartz sands. Geologically fairly close to granitic terroirs, with the same acidic and sandy character, sandstone terroirs have a quite different expression: the wines produced there have a longer acidic spine and are less aromatic. They also require more time to develop their complexity. In Alsace, these limestones are of marine origin from the secondary era. The most common ones are Muschelkalk and Dogger. These rocks disintegrate easily to make way for very stony soils. On these chemically basic terroirs, the wines are always marked by a beautiful acidic, broad and massive structure. Very fermented in their youth, they evolve towards a lemon character over time. They are composed of thick deposits of clay (marl) and limestone pebbles that form a rock called a conglomerate whose evolution is slow and not very visible. The marl's power contribution is sustained by a long and complex acidity. The wines are generous and long in their youth, and age beautifully when mineralized. The greater the proportion of limestone, the finer the wine develops. This is the sandstone variant of the marnocalcary terroir. It's always a matter of falling rocks from the tertiary sector, the pebbles of which are this time sandstone. The marl gives power to the wine while the sandstone lightens it. More generous than on an exclusively stony terroir, the wine's aromas are more complex than on a marly terroir. Frequent in the subsvosgian hills, are made up of clays, limestones and sandstone. The variety of rocks makes it the mineral richness. These deep soils are therefore fertile and have good water retention. To the marl that brings power, limestone and sandstone are lightening factors. The wines take their time to harmonize these somewhat antagonistic components. These soils are quite rare in Alsace. These are sandstone limestones or calcareous sandstones, the quartz grains are generally cemented by limestone. These rocks are virtually unchanged. The soils are very stony and have low mineral fertility. The wines are tight, with fairly intense floral expressions. Clay is the essential component of these soft but compact rocks, always giving heavy and greasy soils. Chemical fertility is high due to the retaining power of various mineral elements exerted by clay. The wines from these terroirs have a powerful structure and take a long time to blossom. The strong presence of clay explains a perception of tannins, even though they are white wines! 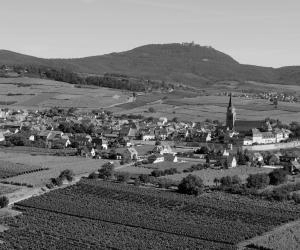 The Grands Crus d' Alsace are wines intimately linked to exceptional micro-terroirs. In order to protect the typical character of these sites and enhance the authenticity of these wines, it was necessary to lay down a clearly defined regulatory framework. From 1975 to 2007, 51 sites were progressively classified as Grands Crus, the surface area of these parcels varying from 3 to 80 hectares. Production rules, the strictest of the vineyard's rules, have been applied to them: high planting density, low yields, etc. Since then, this framework has constantly evolved, giving each locality the possibility of further strengthening these rules. Since 2001, individual local management by Grand Cru has enabled the winegrowers to work together to enhance the quality and typicity of the wines and to make ambitious choices. 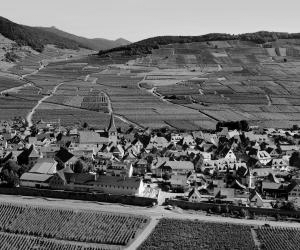 In 2011, the unique Alsace Grand Cru AOC has multiplied into 51 Alsace Grand Cru appellations, thus allowing the protection of each locality. At the same time, many winegrowers are striving to develop cultural practices respectful of the living, in order to express all the complexity of their terroir while perpetuating them. 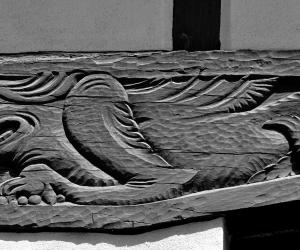 ...which produces year after year, the memory of thousand-year-old stones. Four grape varieties are accepted in the Grand Cru Appellations: Riesling, Muscat, Pinot Gris and Gewurztraminer. 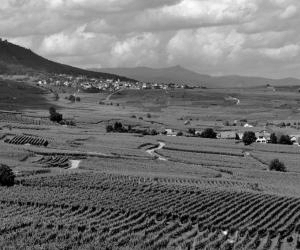 By way of derogation from this rule, Sylvaner is authorised for the place called Zotzenberg. Although the Grands Crus sometimes retain some of the characteristics specific to their grape variety (elegant freshness of the Riesling, aromatic power of the Gewurztraminer, generous intensity of the Pinot Gris, or fruity refinement of the Muscat), they are first of all marked by the influence of their terroir. It is expressed in a wide variety of ways, with infinite modulations: particular intensity of aromas, often dominated by mineral notes, delicate salinity, acidity and subtle vibrations, radiant energy through volume or power, remarkable texture on the palate... Some terroirs transcend the identity of the grape varieties to such an extent that they dominate the other contingencies, determining the personality and physiognomy of the wines. This is why the co-plantation of various grape varieties is practiced in the Altenberg of Bergheim and Kaefferkopf. The Grands Crus of Alsace require time. First of all in the vineyard, where the roots need more than 10 years to deeply examine the most inaccessible stones. Then in the bottle, where the long ageing process will give the Grands Crus the quintessence of their complexity. Two rare and prestigious mentions can complete the appellations Alsace Grand Cru:"Vendanges Tardives" and "Sélection de Grains Nobles". The wines bearing these mentions are harvested in over-ripeness, during very good years, and for the Selections de Grains Nobles, by sorting of the grapes affected by noble rot (Botrytis cinerea), only the most dried berries being preserved. These great wines, chiselled, complex and radiant, are perfect for both the mind and the senses, tasting and sharing. They offer themselves for discussion, are written in memoirs, invite themselves to the best tables. Because the Grands Crus d' Alsace, in their fabulous diversity, are highly gastronomic wines. A refined tension that refines the mouth and enhances the nobility of the dishes. This aerial structure tends to lighten the smoothness or richness of certain preparations. A saline touch, omnipresent in these great local wines, reveals the flavours, while the minerality that develops with more intensity over time, underlines the dishes with firmness and elegance. Some soils dominate the wines, giving them a fullness and power that is in tune with spicy flavours and characterful dishes, for complex and always high quality combinations. The Grands Crus d' Alsace wines fully express their personality between 8 and 10°C. Clear colourless glasses with long stems should preferably be chosen (to avoid warming by hand) and with a slightly narrowed opening to favour the concentration of aromas. A cool cellar at a constant temperature (10 to 15°C), neither too dry nor too humid, and bottles kept lying down are the essential conditions for their good preservation.